The capital of Karen (Kayin) State, Hpa An is a picturesque town with a backpacker feel that sits on the eastern bank of the Thanlwin (Salween) river, about 270 kilometres east of Yangon. The setting itself, the surrounding caves and mountains to explore, and the laid back atmosphere are the highlights of the area. Hpa An (sometimes spelt Pa-An and pronounced Pah-Ann) is encircled by dramatic karst mountain scenery which juts from the surrounding plains, and many of these mountains contain large and religiously significant caves (more details further down this page). Sadly, there has been some open-cast mining in the area, doing permanent damage to this unique landscape – but there remains much to enjoy, and the most impressive example is the beautiful, sacred and monolithic Mount Zwegabin (sometimes spelt Zwekabin), which can be found 16 kilometres south east of Hpa An. There are great views of Zwegabin from the attractive Kan Thar Yar lake (a 15-minute walk from the centre of Hpa An) and also from a lovely roadside beer station south of Hpa An on the road to Mawlamyine (500 metres south of Hotel Zwegabin). On Zaydan Road in the centre of Hpa An, you can find a number of teahouses and restaurants with English-language menus serving local and Asian foods, and at sunset it is worth heading to the Strand Road riverfront for views over the Thanlwin river; there is a food stall which sells beer and drinks near the drop-off point for boats from Maylamyine. To get a bit of background on local culture and history, head to the Kayin Cultural Museum (entry K2,000). For a wider selection of photos from Hpa An and its surrounding area (including the caves), go to our Hpa An photo album. If you want to climb Mount Zwegabin, there are steps all the way to the top but it is hard work, particularly in the heat – and the steps are in varying degrees of repair! It takes two to four hours to get to the summit and back down, depending on your pace; there are people selling water and other refreshments on the way up. The characterful monastery and pagoda at the top of the mountain are a delight, and the canteen there serves fantastic (and usually well deserved!) food; the summit also offers extraordinary views of the surrounding mountains and plains. There is a fee of K3,000 to hike Zwegabin which is payable at the entrance. Check out our YouTube video from the path up Mount Zwegabin and, for a wider selection of photos, go to our Zwegabin photo album. 22 kilometres south east of Hpa An you can find the stunning Sadan Cave, which opens into a gigantic cavern filled with Buddhas and pagodas and can be walked all the way through to the other side, under the mountain. It is truly impressive, and returning you can take a small wooden ferry back under the mountain for K1500 per person, making for a lovely circuit. Take a look at our YouTube videoes of the entrance to Sadan Cave and the Sadan Cave return boat trip. Closer to Hpa An are Kaw Ka Taung caves and pool ; the swimming area here provides an opportunity to wind down and cool off after a day of exploring, and offers lovely views of the surrounding rice paddies and mountains (although, being a popular spot with locals, it can get busy). There are also a number of restaurants here that serve great local and Thai food and it is possible to go kayaking in surrounding paddy fields when they're flooded, with guided village visits - see Travel Hub section further down this page for more info. Directly to the south of Hpa An, on the way to Zwegabin, is the Kyauk Kalap – a truly unique pagoda, set on top of an unusual rock formation in the middle of a (man-made) lake. It is a beautiful spot and another that offers great photo opportunities of Mount Zwegabin. Despite signs that indicate otherwise, women are allowed access. See our YouTube video of Kyauk Kalap. 13 kilometres of paved and unpaved road east of Hpa An, the Taung Wine Pagoda sits atop a limestone mountain. Smaller than Mount Zwegabin and less frequented by tourists, the trek up Taung Wine Mountain, a steep dirt path cutting through dense jungle, skips none of the thrills. Near the top, a sheer iron staircase with spectacular 360 degree views leads to a weathered stupa. Veranda Youth Community Café near Kan Thar Yar Lake hosts the Hpa An Go-Myanmar.com Travel Hub, an information centre for visitors to the area. 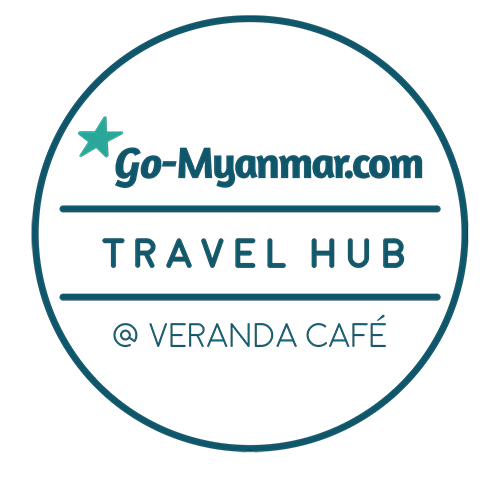 At the Travel Hub, you can book local activities such as cycling and cave tours, motorbike hire, picnic lunches and traditional boxing lessons – as well as consult the friendly staff about wider Myanmar travel. Bus, flight, taxi and hotel bookings are also available through the Travel Hub, which is open Monday to Saturday 9am-5pm. To get to locations around Hpa An, the simplest thing to do is hire a tuk-tuk, either through the Travel Hub or from the centre of town (there are usually dozens readily available). Tuk-tuks can take up to six people and cost around K20,000 for one day; there are also motorbikes for hire, costing around K10,000 per day. The Karen New Year celebrations take place in Hpa An in December, and feature dancing and traditional kick boxing competitions. To check exact dates, go to our festival calendar. There is a Thailand border crossing point at Myawaddy, four hours east of Hpa An; for detailed information on land crossings, go here. We offer a variety of Myanmar country tours that include Hpa An and the surrounding area - find out more here.